One of the most often performed tasks in Photos is the export of images. The Photos Export suite of the Photos Utilities script library reduces the multi-step process involved with exporting photos to images files, into single-line commands, each designed to achieve a specific type of export. In addition, some of the commands offer the option to display in the Finder, either the destination folder or its contents after the export process has completed. Also note that, with the exception of the export originals command, all commands export photos to files in high-quality JPEG format. quick export v : Exports copies of the referenced media items to a newly created folder within the Pictures folder. All image exports are in high-quality JPEG format. [ resulting file references boolean ] : A boolean value indicating whether the command should return as its result, a list of references to the exported files. If the value is false, the command result will be a reference to the created export folder. Default value is true. [ Finder reveal boolean ] : A boolean value indicating whether the export results (files or folder) should be revealed in the Finder. Default value is false. → folder reference|list of file references : Depending on the value of the “resulting file references” parameter, the result can be a reference to the output folder, or a list of references to the exported files. export originals v : Exports copies of the orignial masters of the referenced media items to a newly created folder within the Pictures folder. sequentially named export v : Exports copies of the referenced media items, named sequentially, to a newly created folder within the Pictures folder. EX: Vacation-001.jpg, Vacation-002.jpg, etc. All image exports are in high-quality JPEG format. [ base name text ] : The base name to use for the sequenced exported files. [ separator text ] : The text used to separate the base name from the numeric sequence. Default is a space. [ sequence length integer ] : The minimum length of the numeric sequence. Leading zeros will be added, if needed, to match the minimum length (length of 4 = 0001, 0002, etc.). For no leading zeros, set the value to 1. If the parameter is not used, the default value is automatically determined to match the count of input items. [ starting number integer ] : The number to begin the naming sequence. Default is 1.
export to Keynote v : Exports copies of the referenced media items, and imports them into the current slide in the frontmost Keynote document. If no document is open in Keynote, one will be created using the current Keynote defaults. [ new document from template named text ] : If this optional parameter is included, a new Keynote document will be created using the named template. To invoke the default template, set the parameter’s value to be an empty string: ""
[ new slide for each boolean ] : A boolean value indicating whether a new slide should be created for each exported photo. Default value is true. export to Numbers v : Exports copies of the referenced media items, and imports them into the active in the frontmost Numbers document. If no document is open in Numbers, one will be created using the current Numbers defaults. [ new document from template named text ] : If this optional parameter is included, a new Numbers document will be created using the named template. To invoke the default template, set the parameter’s value to be an empty string: ""
export to Pages v : Exports copies of the referenced media items, and imports them into the current page in the frontmost Pages document. If no document is open in Pages, one will be created using the current Pages defaults. [ new document from template named text ] : If this optional parameter is included, a new Pages document will be created using the named template. To invoke the default template, set the parameter’s value to be an empty string: ""
The following scripts demonstrate the use of the commands in the Photos Export Suite. 01 use script "Photos Utilities"
07 display dialog "Enter the base name for the exported files:" default answer ""
09 if baseName is "" then set baseName to "Untitled"
NOTE: The commands for exporting to iWork documents all export Photos images to files and then imports the exported files into the iWork documents. After the iWork import process has completed, the folder containing the exported images is moved to the trash. 07 new document from template named "Blank Landscape"
For those interested in creating and writing scripts and script libraries, the Photos Utilities Script Library is written in AppleScriptObj-C, a dynamic fusion of the AppleScript and Objective-C programming languages. The source code of the library can be viewed in a script editing application. 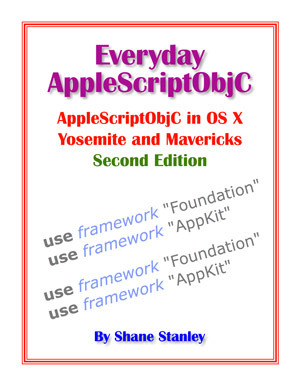 Comprehensive 3rd-party documentation and tools for writing and deploying AppleScriptObj-C applications, scripts, and script libraries are available from Myriad Communications.